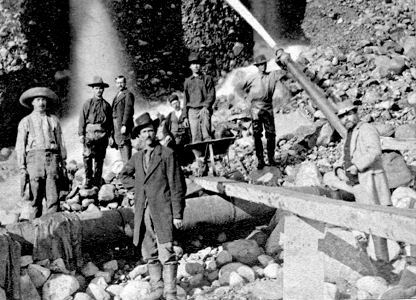 Prospectors entered what is now Summit County (then part of Utah Territory) during the Pikes Peak Gold Rush of 1859, soon after the placer gold discoveries farther east at Idaho Springs. 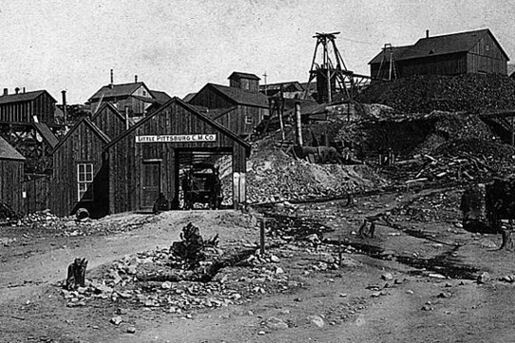 Breckenridge was founded to serve the miners working rich placer gold deposits discovered along the Blue River. 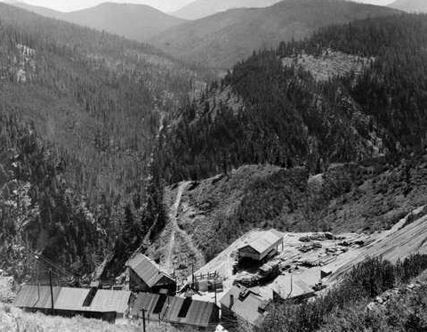 Placer gold mining was soon joined by hard rock mining, as prospectors followed the gold to its source veins in the mountains. Gold in some upper gravel benches north of the Blue River was recovered by hydraulic mining. 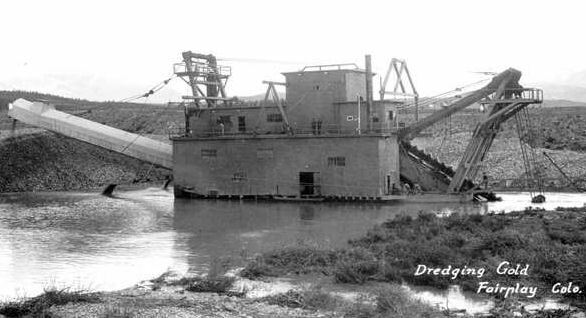 Gold production decreased in the late 1800s, but revived in 1908 by gold dredging operations along the Blue River and Swan River. 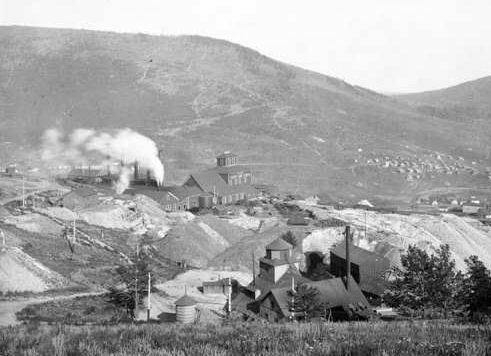 The Breckenridge mining district is credited with production of about one million troy ounces of gold. The original townsite of Creede was located on East Willow Creek just above its junction with West Willow Creek. Below Creede were Stringtown, Jimtown, and Amethyst. 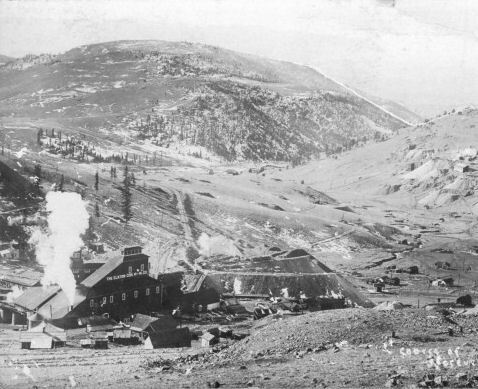 The Willow Creek site was soon renamed Creede after Nicholas C. Creede who discovered the Holy Moses Mine. Soon the entire town area from East Willow to Amethyst was called Creede. The town leapt from a population of 600 in 1889 to more than 10,000 people in December 1891. 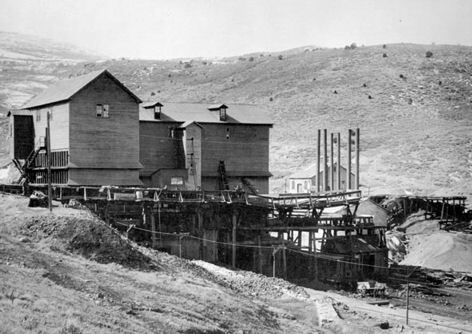 The Creede mines operated continuously from 1890 until 1985. 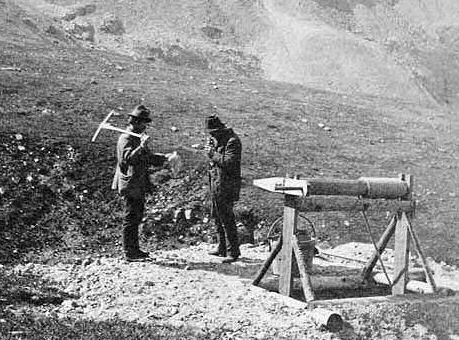 Creede’s boom lasted until 1893, when the Silver Panic hit all of the silver mining towns in Colorado. The price of silver plummeted and most of the silver mines were closed. 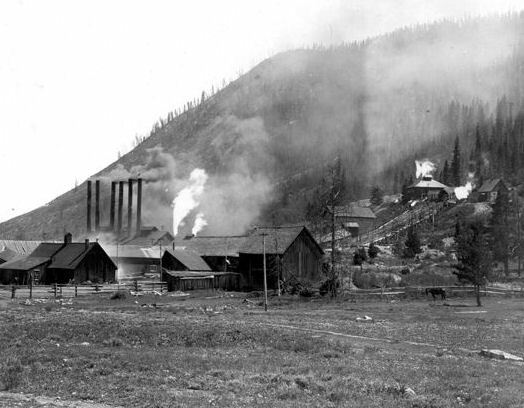 Creede never became a ghost town, although the boom was over and its population declined. 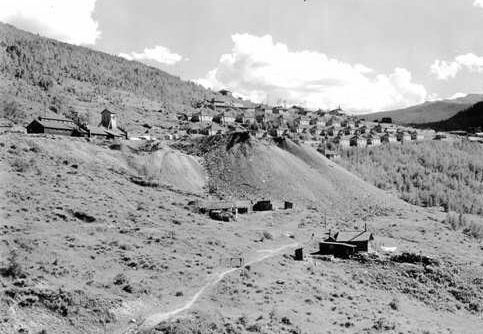 After 1900, Creede stayed alive by relying increasingly on lead and zinc in the ores. 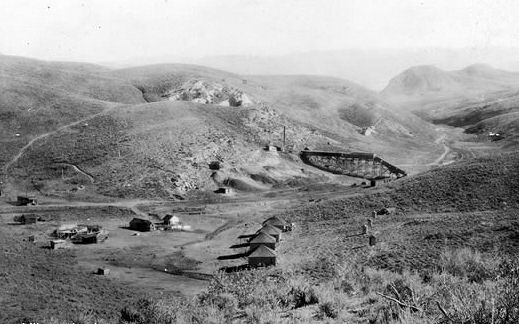 At an elevation of 9,494 feet and just below timberline, for many years Cripple Creek's high valley was considered no more important than a cattle pasture. Many prospectors avoided the area after the Mount Pisgah hoax, a mini gold rush caused by salting (adding gold to worthless rock). 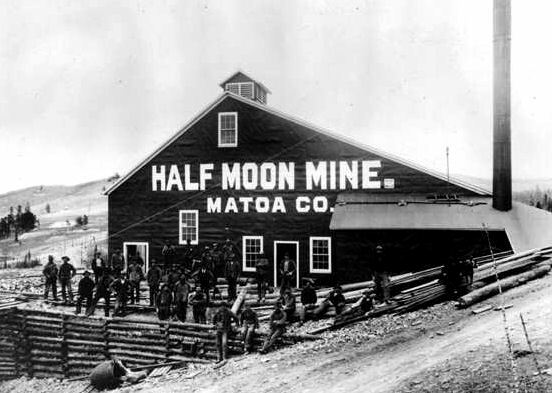 On October 20, 1890, however, Robert Miller "Bob" Womack discovered a rich ore and the last great Colorado gold rush was on. 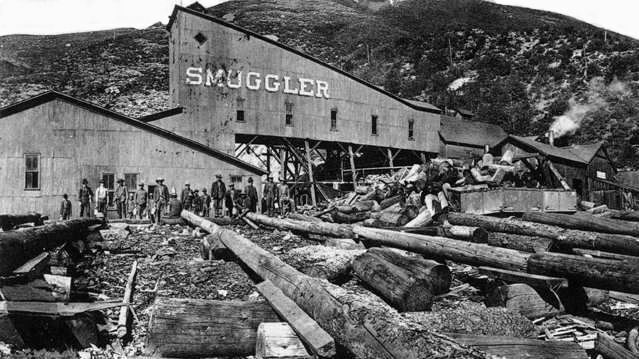 Thousands of prospectors flocked to the region, and before long Winfield Scott Stratton located the famous Independence lode, one of the largest gold strikes in history. In three years, the population increased from 500 to 10,000 by 1893. 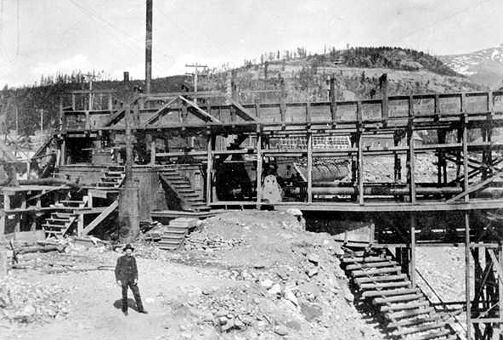 Though $500,000,000 worth of gold ore was dug from Cripple Creek, Womack himself would die, penniless, on August 10, 1909. During the next 10 years gold production exploded and the town grew rapidly. 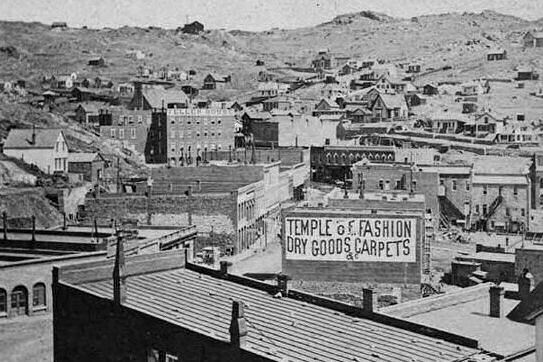 By 1900 over 55,000 people resided in and around Cripple Creek. The district boasted an estimated 150 saloons, plus dance halls, theaters, hotels, restaurants, shops, and an extensive red-light district. There were 41 assay offices, 91 lawyers, 46 brokerage houses, and 14 newspapers (including one serving its many black residents). Almost 500 mines pulled millions of dollars worth of gold from the ground annually. 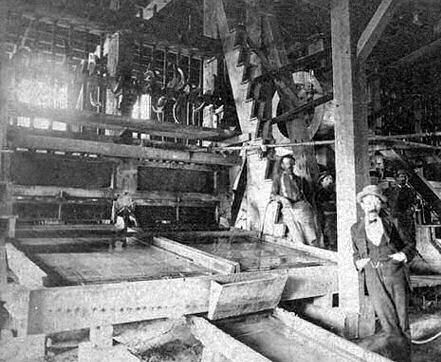 Production peaked in 1900, with over 878,000 ounces of gold produced. The town managed this growth despite two major fires in 1896 that left most of the town in ashes. 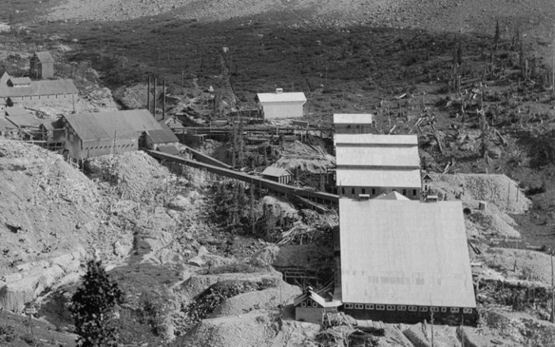 Gold production declined after 1900, and a consolidation of mining properties began. 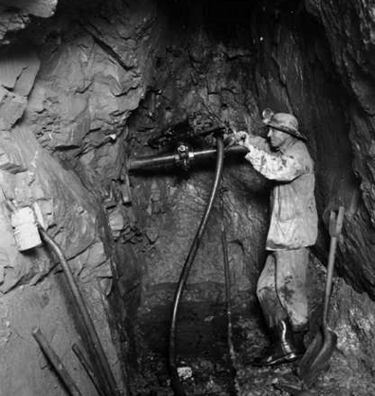 By the early 1940’s gold production was down to 125-145,000 ounces per year. Declining production and improved mining efficiency reduced demand for miners, and the businesses that served them. 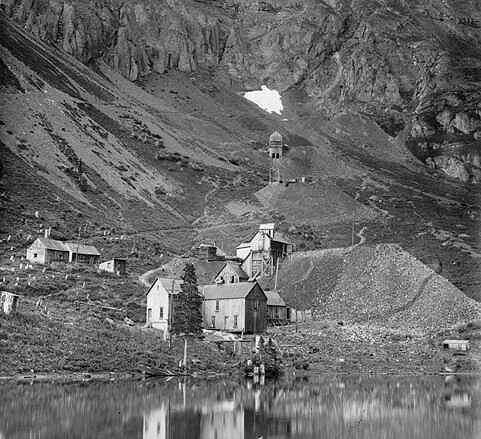 The last mine closed in 1962, and the town dwindled, relying on a modest summer tourist industry. 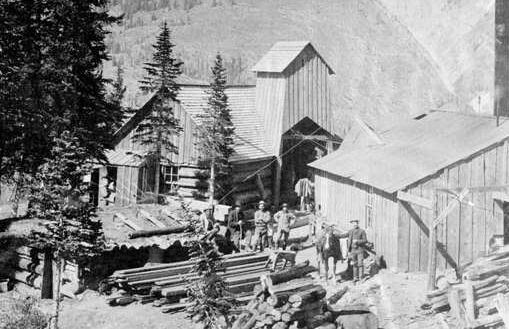 Gold in the Telluride area was first discovered in 1858. 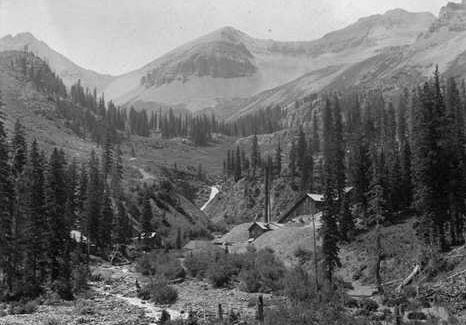 John Fallon made the first claim in Marshal Basin above Telluride in 1875 and early settlement of Telluride followed. The town itself was founded in 1878. 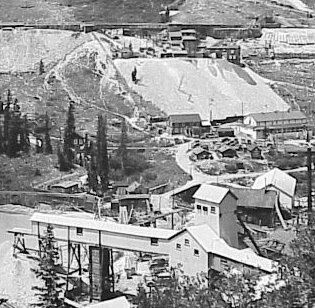 Telluride's mines were rich in zinc, lead, copper, silver, and gold.Telluride developed slowly because of its isolated location. 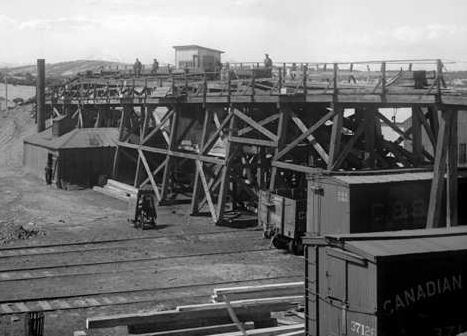 In 1881, Otto Mears opened a toll road which allowed wagons to reach Telluride. 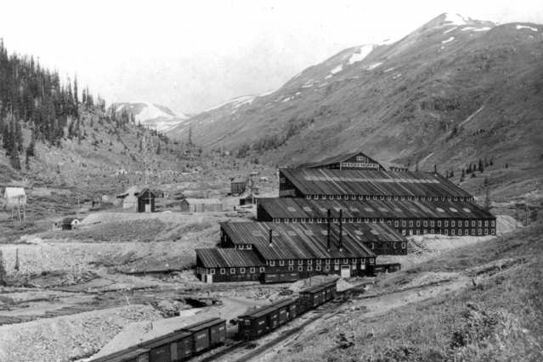 This increased the number of people in Telluride, but it was still expensive to get gold-rich ore out of the valley. 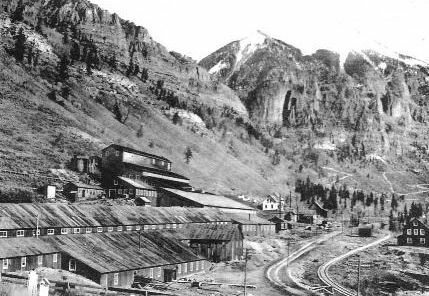 In 1890 the railroad reached town, which brought in more mines and brought out more ore.
Telluride’s most famous historic mines are the Tomboy, Pandora, Smuggler-Union, Nellie, and Sheridan mines. 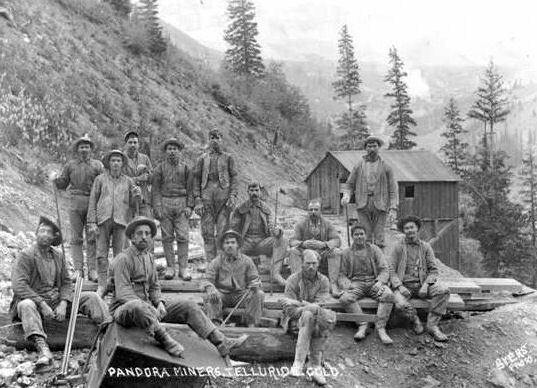 Beginning in 1939, the hard-rock mining operations in the Red Mountain and Telluride mining districts began a lengthy consolidation under the Idarado Mining Company, presently a division of Newmont Mining. 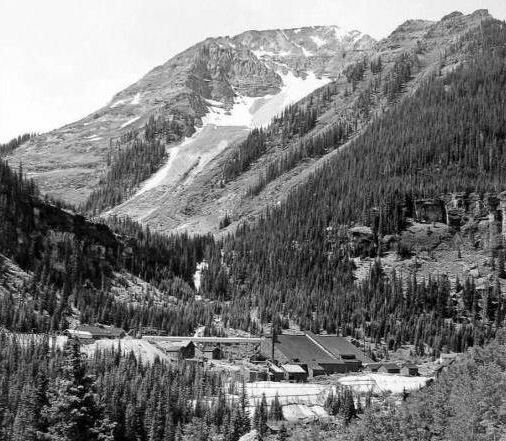 The consolidation ended in 1953 with Idarado’s acquisition of the Telluride Mines. 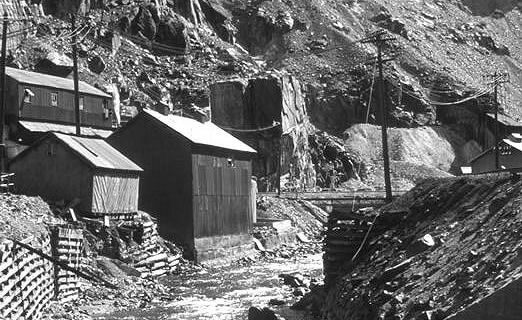 Idarado kept the underground workings and mill operations open at Telluride’s Pandora hard-rock mine until 1978. 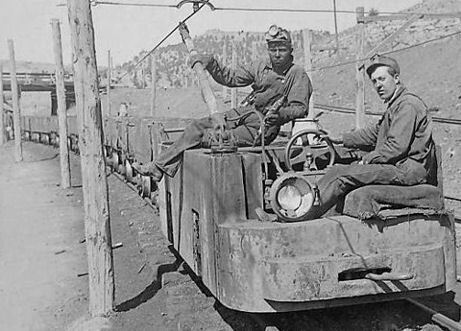 Coal mining in Colorado dates back to 1859, when a pair of men began mining a coal deposit between the gold rush settlements of Denver and Boulder. 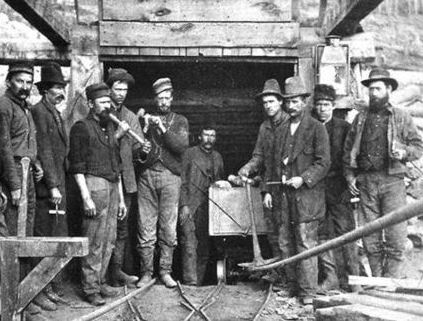 Although the discovery of coal did not cause boom cycles as did gold and silver, the early coal mining industry did established the conditions for violent confrontations between miners and mine owners. 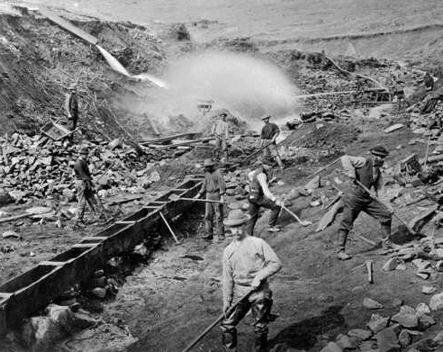 The usual issues were wages, hours, and working conditions, but miners were also concerned about issues of fairness, and company control over their personal lives. 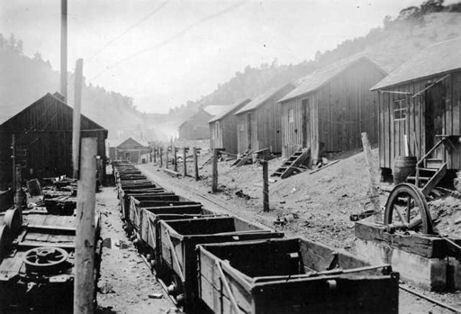 Early coal mining in Colorado was extremely dangerous, and the state had one of the highest death rates in the nation. 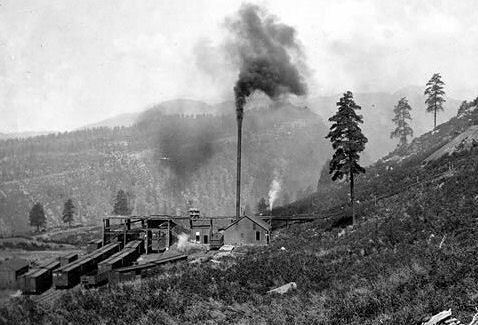 During the three decades from 1884 to 1914, more than 1700 men died in Colorado's coal mines. 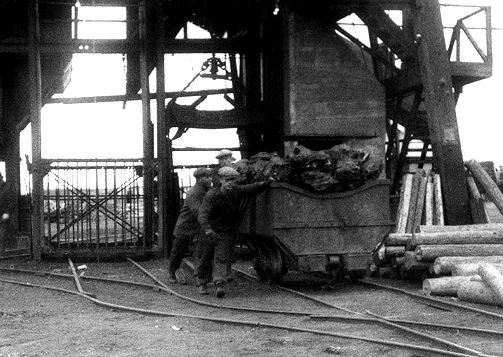 Coal miners also resented having to pay for safety work such as timbering the mines, and they were sometimes paid in scrip that had value only in the company store, with the cost of goods set by the company. 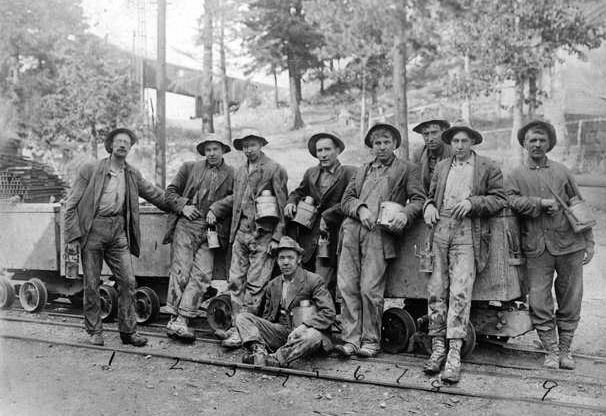 Erie, Colorado claims the first mining labor union in Colorado, which was the Knights of Labor, Local No.771, established in 1878. 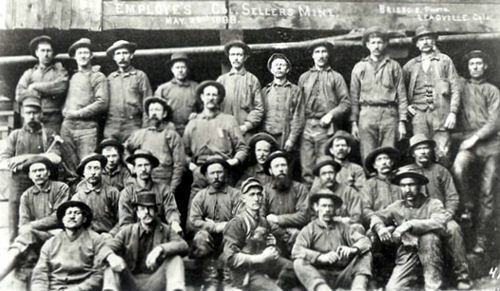 The Knights of Labor opposed the creation of the National Federation of Miners and Mine Laborers during the 1880s. 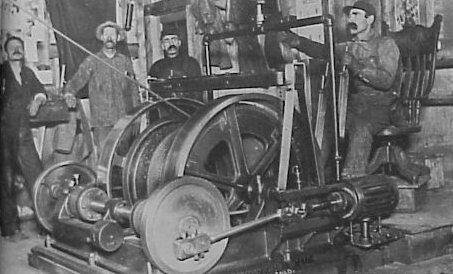 The first strike was called in 1885 by the Knights of Labor. 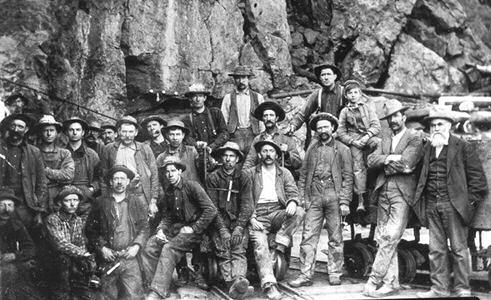 Then in 1886 a regional miners organization was formed, called the Coal Miners' Federation of Northern Colorado. 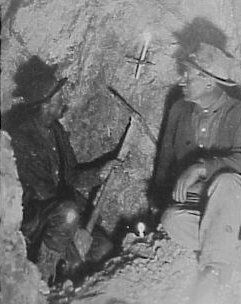 The United Mine Workers (UMW) were defeated by company spies in a strike in the southern field in 1903-04. 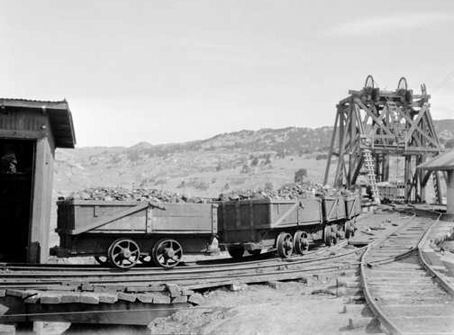 The UMW called another strike in Colorado's northern coal fields north of Denver in 1910. 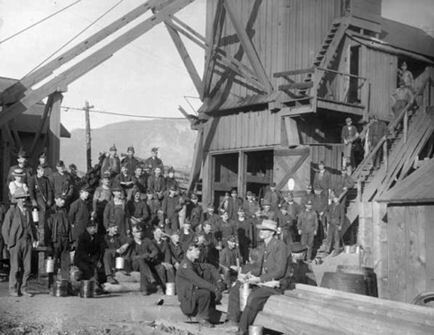 The strike was inconclusive, but prompted a 10 percent wage increase for ten thousand Colorado miners. The union's real target in Colorado was the larger southern field. 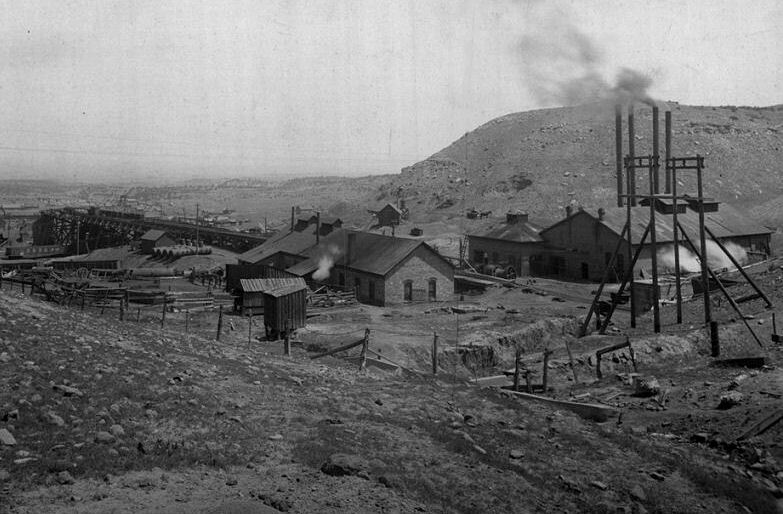 A state-wide strike called in September 1913 resulted in the Ludlow Massacre. Neutralized by the dispatch of federal troops after ten days of skirmishes provoked by the massacre, the UMW essentially suspended most activities in Colorado for more than a decade. Meanwhile the organization grew stronger in the east. 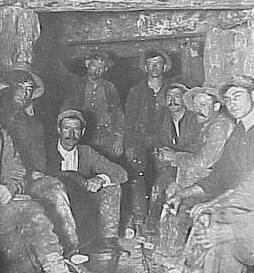 The United Mine Workers were defeated during the 1913-14 strike in Colorado and focused their attention elsewhere. 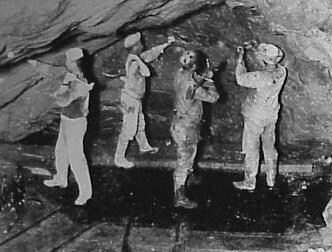 In 1927 Colorado coal miners again laid down their tools, this time under the banner of the Industrial Workers of the World (IWW). 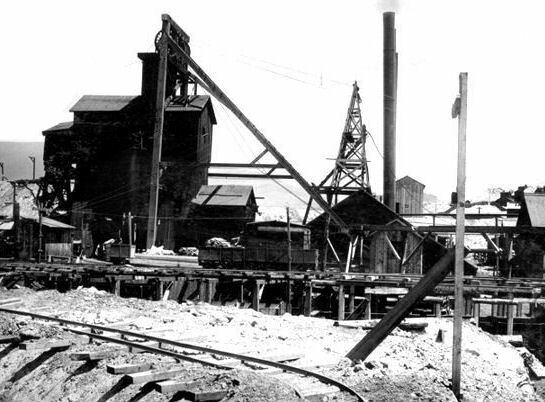 Colorado Fuel and Iron, a major conglomerate of steel mills in Pueblo and coal mines around the region, opposed the strike. The company once again hired spies to infiltrate the union. 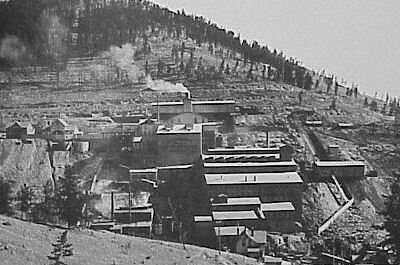 The 1927–28 strike is best remembered for the Columbine mine massacre. This strike also led directly to Rocky Mountain Fuel Company's decision to unionize the workforce, and President Josephine Roche announced that she would recognize any union affiliated with the American Federation of Labor. In announcing this policy, President Roche avoided recognizing the radical IWW, which had successfully shut down 113 of the state's 125 coal mines. 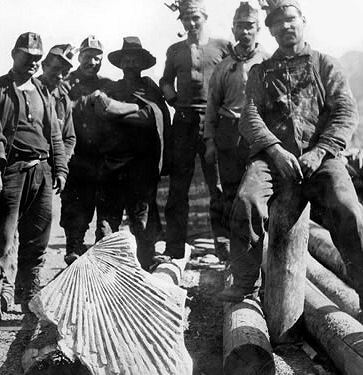 Thus, in 1928 the United Mine Workers was awarded its first contract in Colorado. 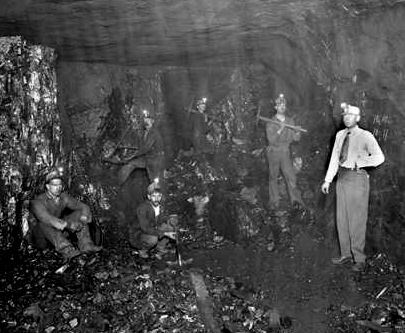 In 1933, legislation enabled unionization throughout Colorado's coal fields. 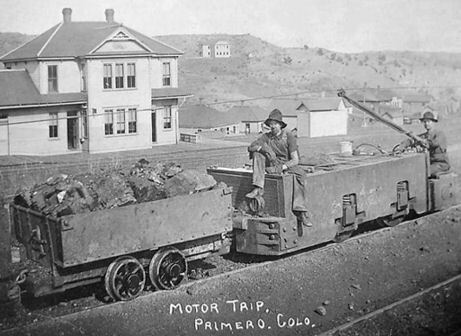 Colorado is the seventh largest coal-producing state in the country. 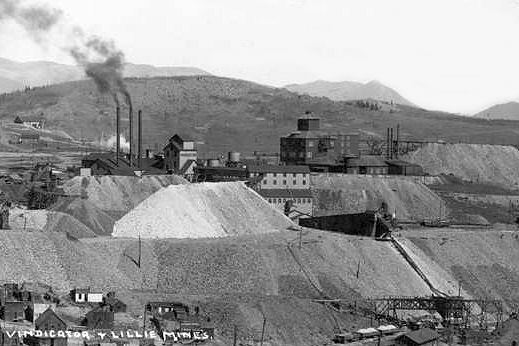 In 2007, Colorado mines produced 36.1 million tons of coal, and employed 2,069 miners. Most Colorado coal is used for electric power generation. 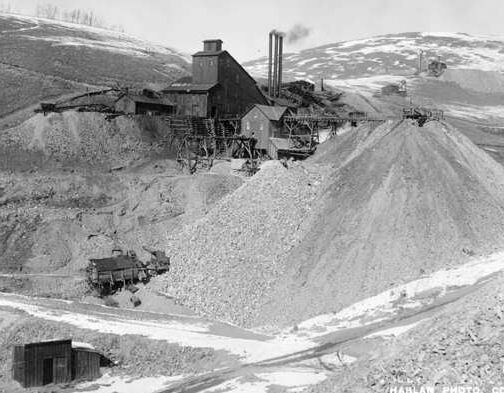 Eleven coal mines operate in Colorado, including eight underground mines in Delta, Garfield, Gunnison, La Plata, Rio Blanco, and Routt counties, and three surface mines in Moffat and Montrose counties. All active coal mines are on the western slope, although the New Elk coal mine in Las Animas County is being permitted to reopen. 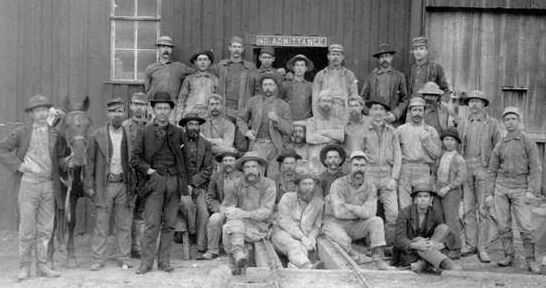 Participants in the Pike's Peak Gold Rush from 1858 to 1861 were called Fifty-Niners, and many of the new arrivals settled in the Denver area. Gold in paying quantities was also discovered in the Central City area. 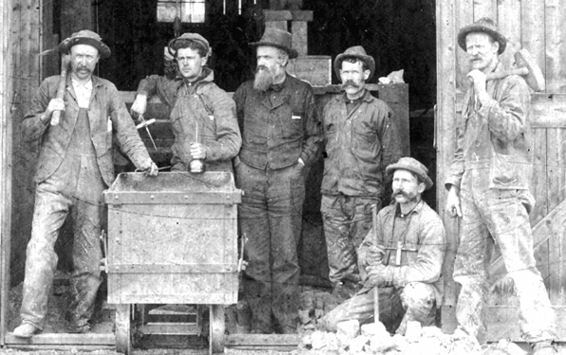 In 1879, silver was discovered in Leadville, resulting in the Colorado Silver Boom. 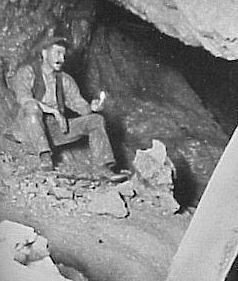 On May 6, 1859, during the Pike's Peak Gold Rush, John H. Gregory found a gold-bearing vein (the Gregory Lode) in Gregory Gulch between Black Hawk and Central City. Within two months many other veins were discovered, including the Bates, Gunnell, Kansas, and Burroughs. By 1860 the population of Central City was 598. At its peak in population in 1900, 3,114 people lived in Central City. Black Hawk, "The City of Mills," is one of Colorado's oldest cities. 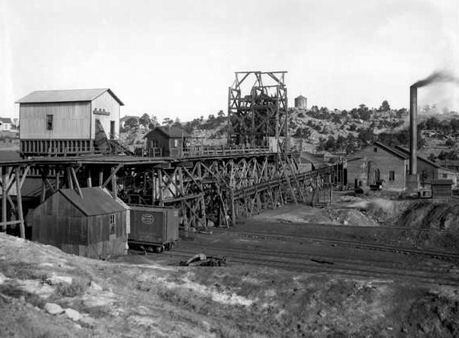 It is one of a number of towns that grew up in "Gregory's Gulch," the narrow ravine where Georgia prospector John H. Gregory first discovered lode gold in the western part of Kansas Territory in 1859. 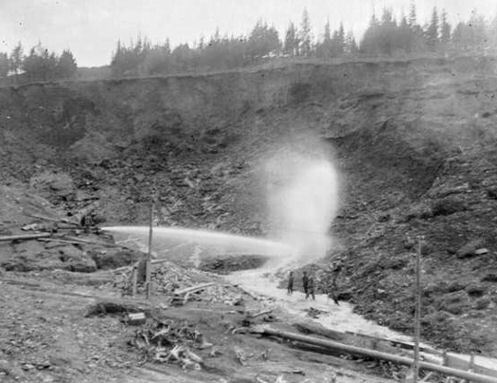 Within months, thousands of would-be miners poured into the gulch, hoping for more big strikes like Gregory's. 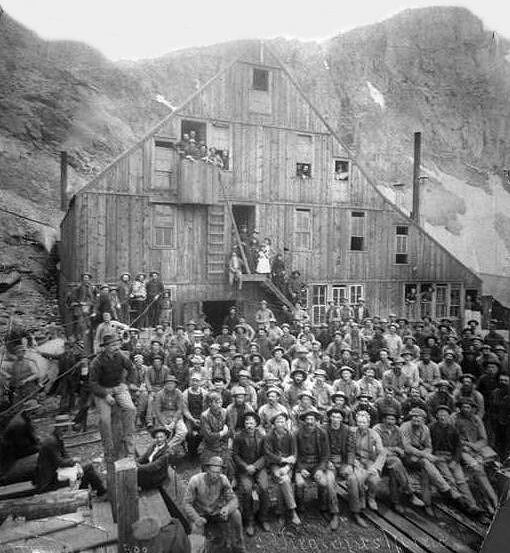 A few found bonanzas, many found paying claims, but the great majority either moved elsewhere to try their luck or, proclaiming the whole "Pike's Peak Gold Rush" a hoax, went back to their settled lives in the States. 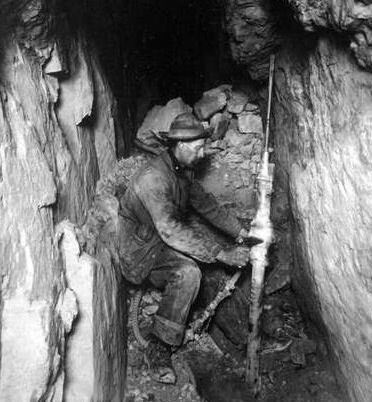 William Greeneberry Russell, a miner from the gold fields of northern Georgia, had come to the vicinity of present-day Denver, then part of western Kansas Territory, in 1858. In early 1859, he was drawn to the mountains by the discovery of gold in nearby Gregory Gulch. 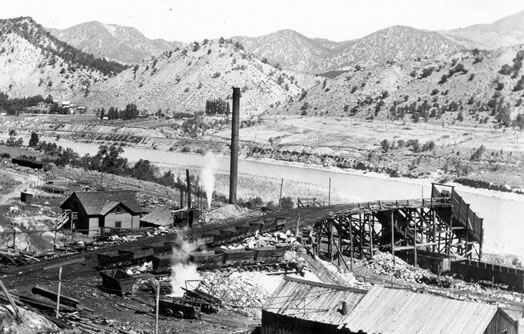 Russell discovered placer gold deposits in June 1859 in the valley that was soon named Russell Gulch in his honor. 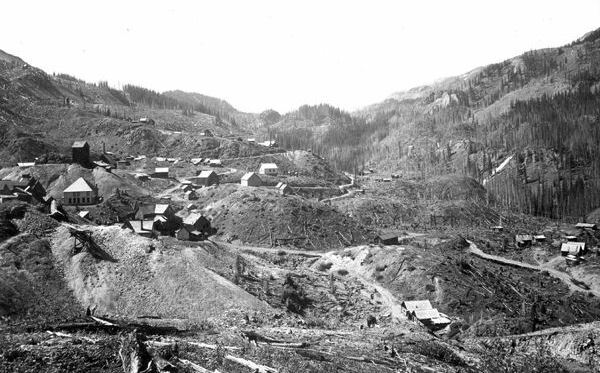 By the end of September, 891 men were mining gold in the gulch, and the eponymous town was built near the head of the gulch to serve the miners. 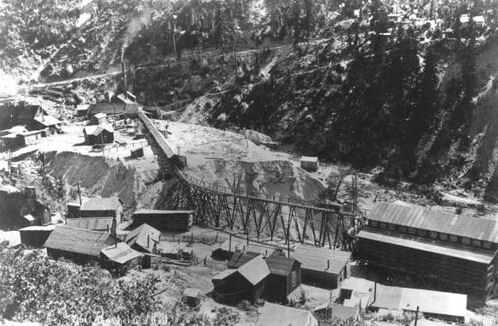 Placer gold was discovered in California Gulch in 1860, during the Pikes Peak Gold Rush, and the town of Oro City sprung up near present-day Leadville. The boom was brief, and Oro City never became a major settlement. 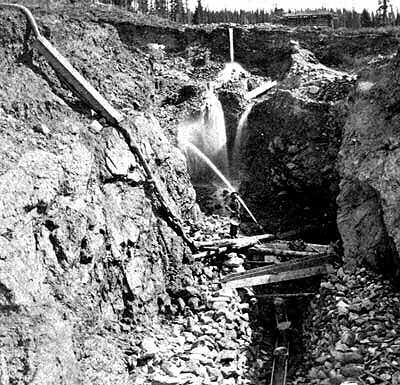 The placer gold mining was hampered by heavy brown sand in the sluice boxes. 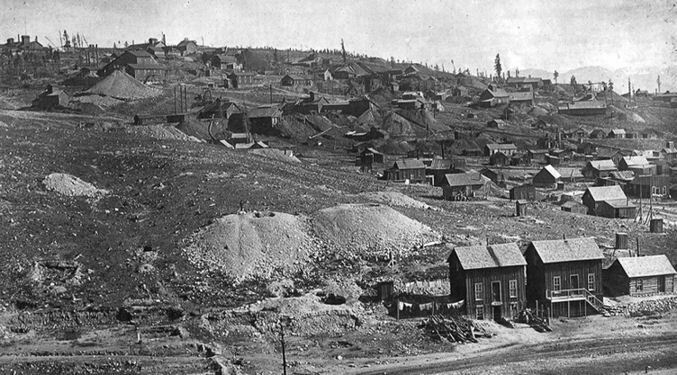 Gold was suddenly discovered over the Mosquito Range at Buckskin Joe, near present day Fairplay, and the Leadville area quickly became virtually deserted as thousands headed for the new gold fields over Mosquito Pass.The rich silver-lead ores, which later were to give this region a world-wide reputation, were undiscovered, or rather unrecognized. 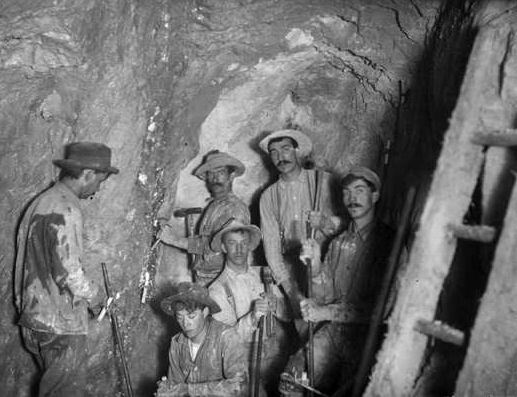 In 1874, gold miners at Oro City discovered that the heavy sand that impeded their gold recovery was the lead mineral cerussite (lead carbonate), that carried a high content of silver. Although later many claimed to have known of the rich silver-lead ores, their practical discovery was due to A. B. 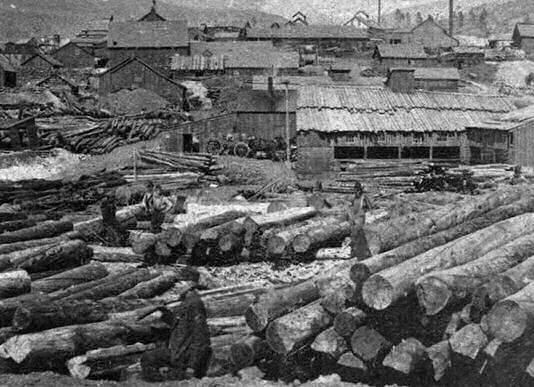 Wood, an experienced miner and metallurgist who came to the region in 1874. 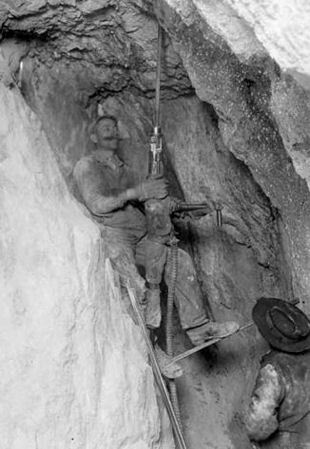 Prospectors traced the cerussite to its source, and by 1876, had discovered several lode silver-lead deposits. 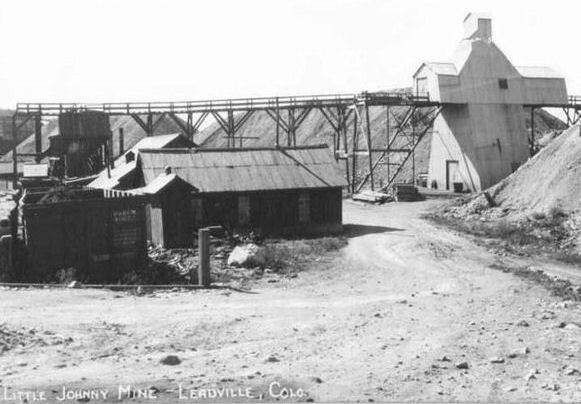 The city of Leadville was founded near the new silver deposits in 1877, helping set off the Colorado Silver Boom. 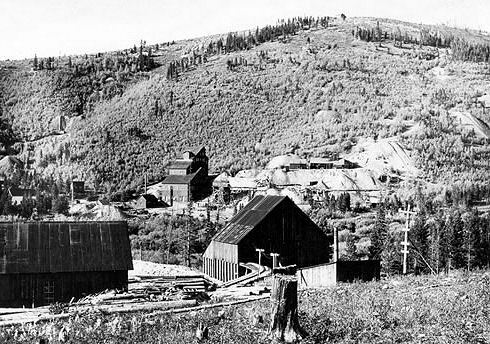 By 1880, Leadville was one of the world's largest silver camps, with a population of over 40,000. 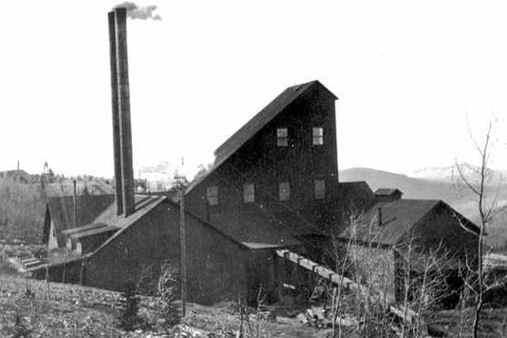 By 1881 there were 14 smelters and reduction plants operating in the Leadville district. 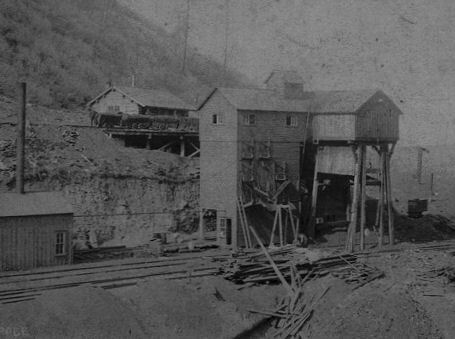 Some of the leading mining properties in the district included the Matchless, Morning Star, Iron Silver, Catalpa, Chrysolite, and Little Pittsburgh. Silver production reached a peak of over $11,000,000 in 1880, leveled out at about $10,000,000 for a number of years and then began to decline. 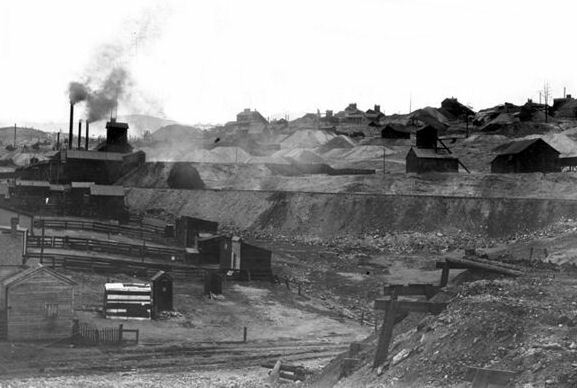 The city's fortunes declined with the repeal of the Sherman Silver Purchase Act in 1893, although afterwards there was another small gold boom. Mining companies came to rely increasingly on income from the lead and zinc.The district is credited with producing over 2.9 million troy ounces of gold, 240 million troy ounces of silver, 1 million tons of lead, 785 thousand tons of zinc, and 53 thousand tons of copper. 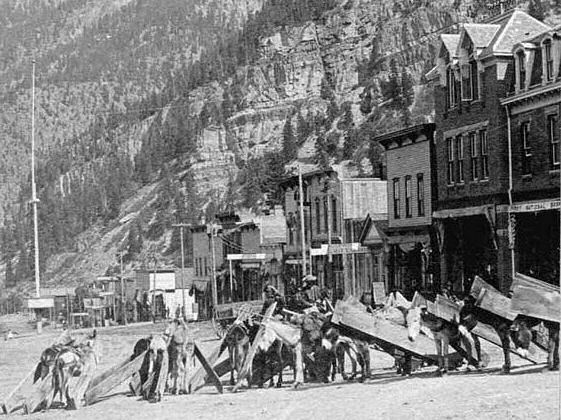 Originally established by miners prospecting for silver and gold in the surrounding mountains, Ouray at one time boasted more horses and mules than people. Prospectors arrived in the area in 1875. 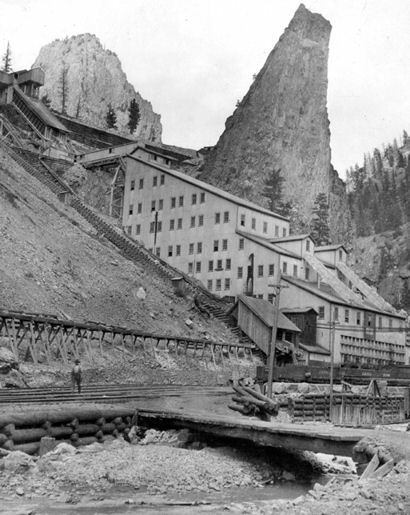 At the height of the mining, Ouray had more than 30 active mines. The town,after changing its name and that of the county it was in several times, was incorporated on October 2, 1876, named after Chief Ouray of the Utes, a Native American tribe. 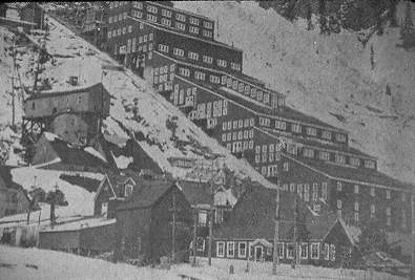 By 1877 Ouray had grown to over 1,000 in population and was named county seat of the newly formed Ouray County on March 8, 1877. 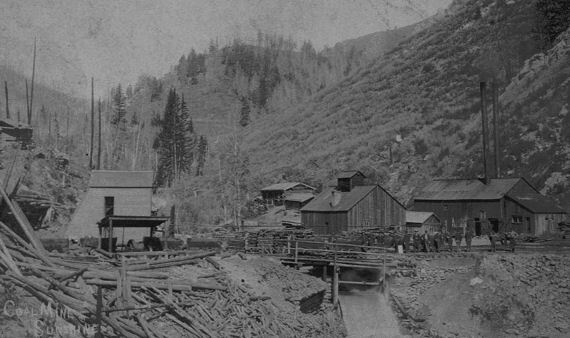 By 1880 with the frenzy for precious metals, Ouray had grown into a booming mining town with over 2,600 inhabitants. 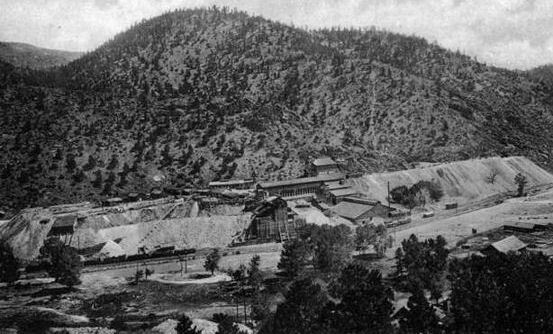 The largest and most famous mine was the Camp Bird Mine, the second largest gold mine in Colorado, established by Thomas Walsh in 1896. 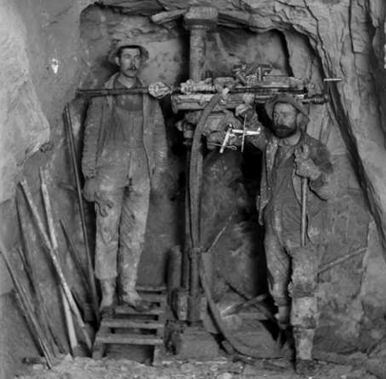 Two of the original claims, the Una and the Gertrude, had been worked for lead-copper-zinc ore, but when re-sampled by Walsh and Andy Richardson, showed a vein of quartz that assayed as high as $3000/ton in gold. 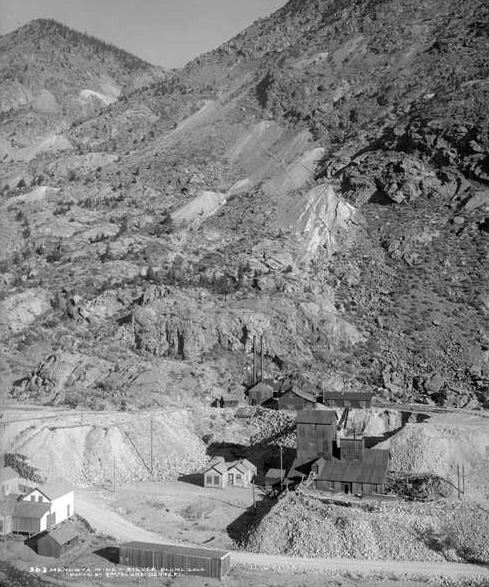 During its lifespan, the mine produced about 1.5 million troy ounces of gold, and 4 million troy ounces of silver, from 1896 to 1990. 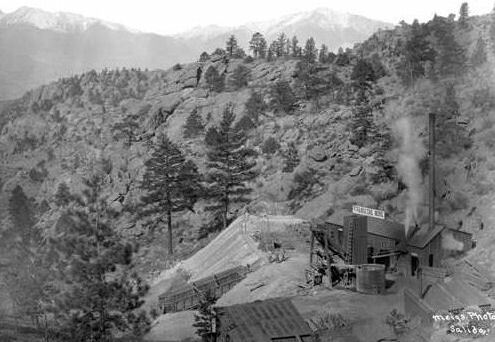 Founded in 1859 by prospectors during the early days of the Pike's Peak Gold Rush, Idaho Springs was at the center of the region's mining district throughout the late nineteenth century. 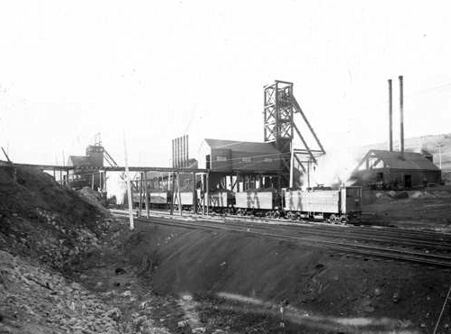 The Argo Tunnel drained and provided access to many ore lodes between Idaho Springs and Central City. 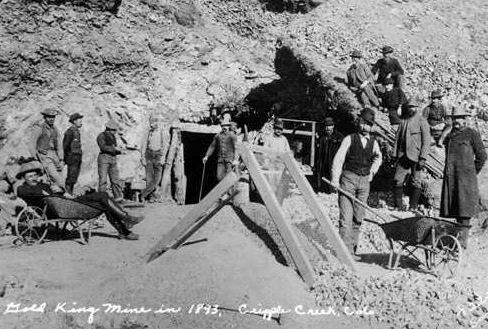 On January 5, 1859, during the Colorado gold rush, prospector George A. Jackson discovered placer gold at the present site of Idaho Springs, where Chicago Creek empties into Clear Creek. 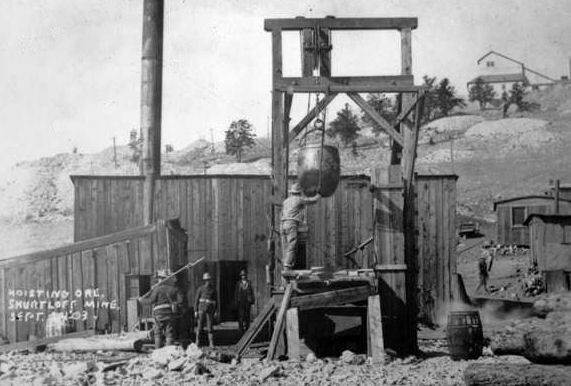 It was the first substantial gold discovery in Colorado. 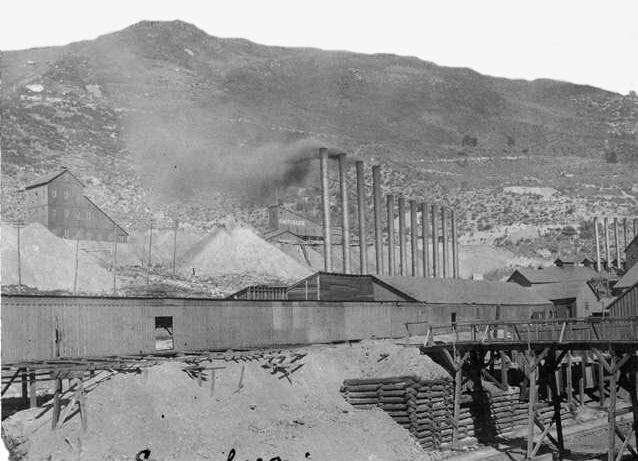 Jackson, a Missouri native with experience in the California gold fields, was drawn to the area by clouds of steam rising from some nearby hot springs. Jackson kept his find secret for several months, but after he paid for some supplies with gold dust, others rushed to Jackson's diggings. The location was originally known as "Jackson's Diggings." 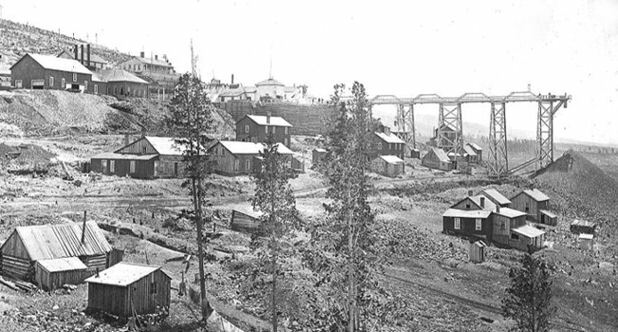 Once the location became a permanent settlement, it was variously called "Sacramento City," "Idahoe," "Idaho City," and finally "Idaho Springs." The first placer discoveries were soon followed by discoveries of gold veins in the rocks of the canyon walls on both sides of Clear Creek. 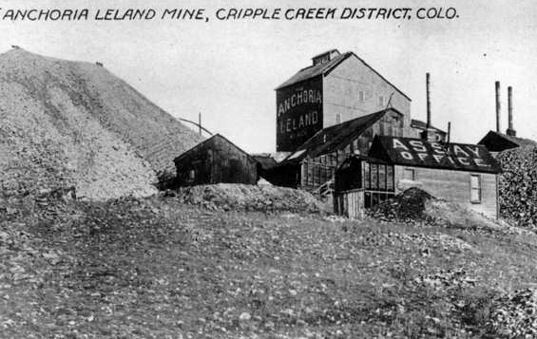 Hard rock mining remained the mainstay of the area long after the gold-bearing gravels were exhausted. 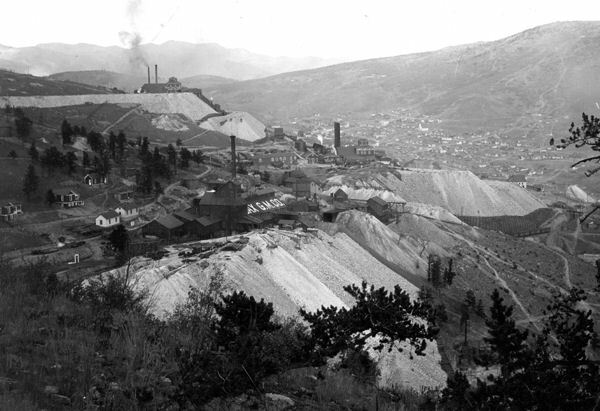 A strike by Idaho Springs miners demanding the eight-hour day in May 1903 erupted into violence, and was one local struggle in a much broader fight called the Colorado Labor Wars. 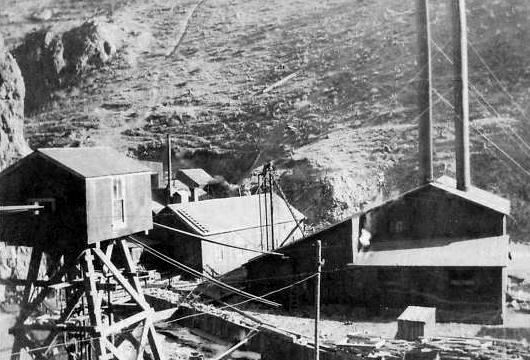 Several mining operations had sprouted along Battle Mountain by 1879, the first year of the Colorado Silver Boom. 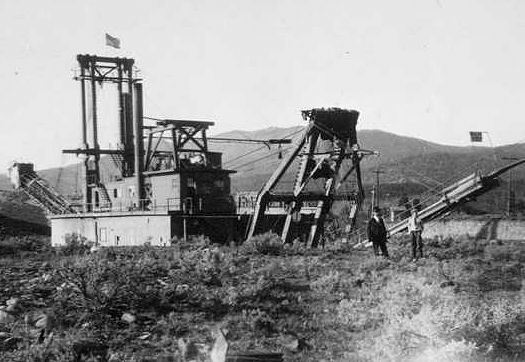 The town of Gilman and nearby mining operations were developed in the 1880s by John Clinton, a prospector, judge, and speculator from nearby Redclliff. 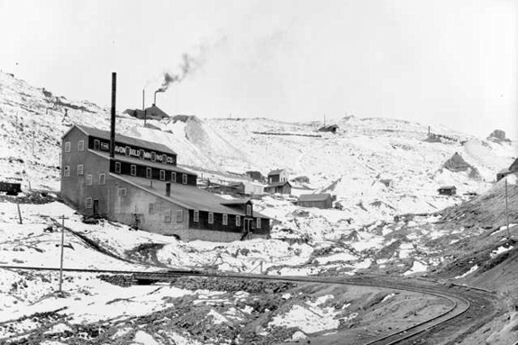 In 1887, gold and silver were discovered in two vertical chimneys at the Ground Hog Mine, which continued to produced gold and silver ore until the 1920s. 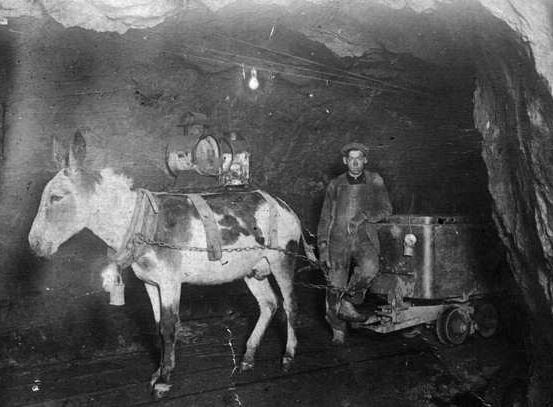 In the 1880s, Clinton acquired a number of mining operations in the vicinity, including the profitable Iron Mask, noted for its numerous caverns with crystal formations. 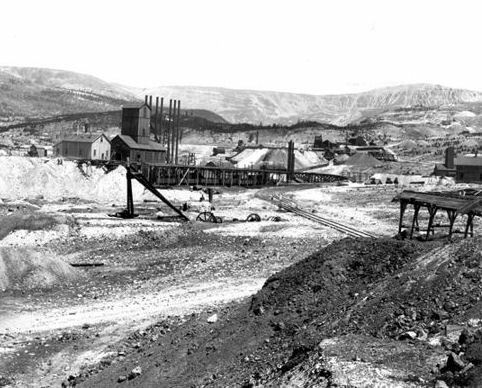 Clinton developed the area as a town and improved the mining operations with higher capitalization. 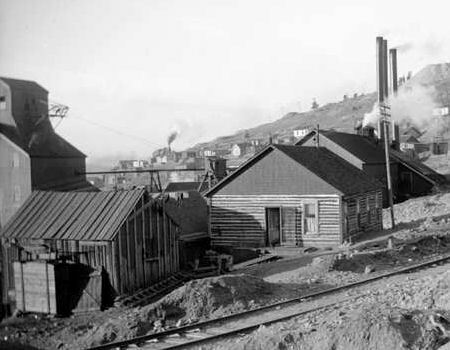 The town, which Clinton developed in order to keep miners at the site, was initially named for him. He donated the land for its initial schoolhouse and built its first boarding house. 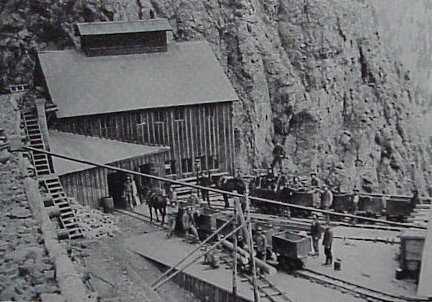 The Denver and Rio Grande Railroad reached the mining camp of Belden at the base of the cliff in 1882. 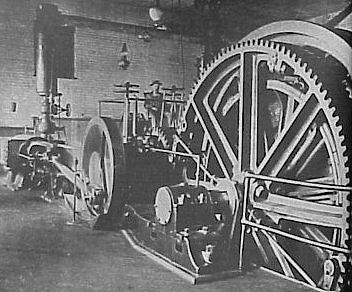 By 1899, it had a population of approximately 300, as well as a newspaper, called the Gilman Enterprise. 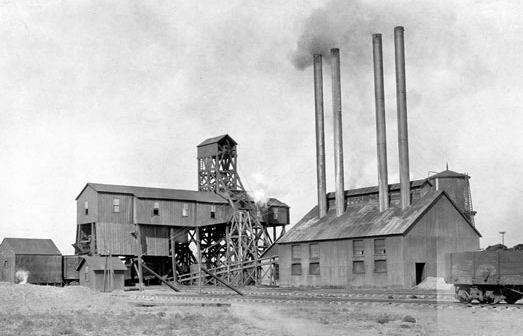 As they reached the deeper sulfide ores, the miners found that the ore contained so much zinc that the smelters refused to purchase it. 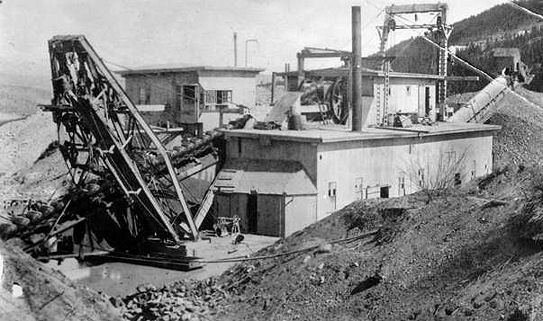 A roaster and magnetic separator were installed in 1905 to separate out the zinc minerals, turning the former problem into an asset. 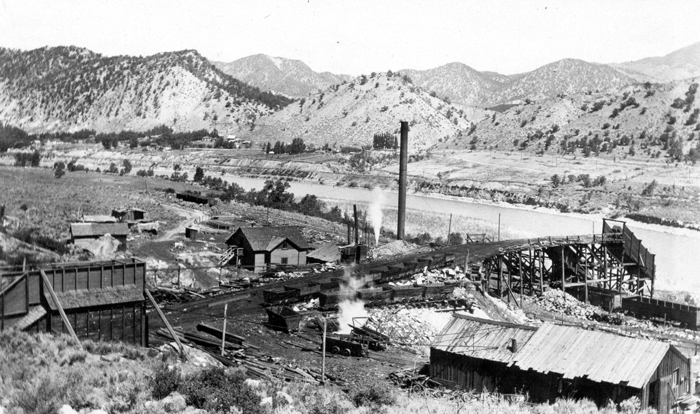 The mining operations transitioned increasingly to zinc, although the Eagle Mine was still the leading producer of silver in the state in 1930. The Uravan mineral belt is an arcuate zone of uranium-vanadium deposits in San Miguel, Montrose, and Mesa counties, Colorado, and Grand County, Utah. 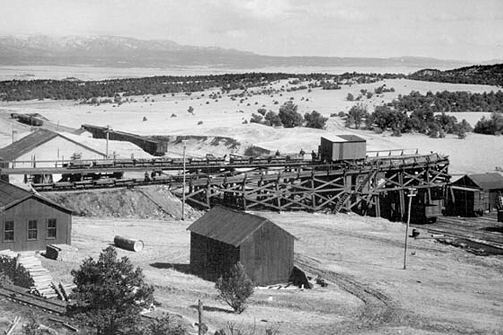 It was the area most productive of uranium in the United States in the early 20th century. The mineral belt includes the Slick Rock, Gypsum Valley, Uravan, and Gateway mining districts. 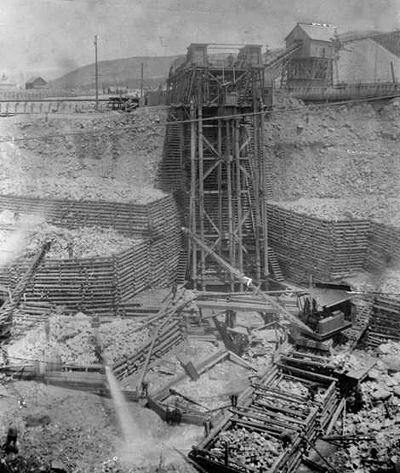 Uranium mining in southwest Colorado goes back to 1898, when a miner dug ten tons of yellow ore that tested high in uranium and vanadium out of a deposit at Roc Creek in Montrose County, Colorado, and shipped it to France, where M. M. C. Friedel and E. Cumenge identified the new mineral that they named carnotite. The mineral was mined for its vanadium, with uranium as a byproduct. 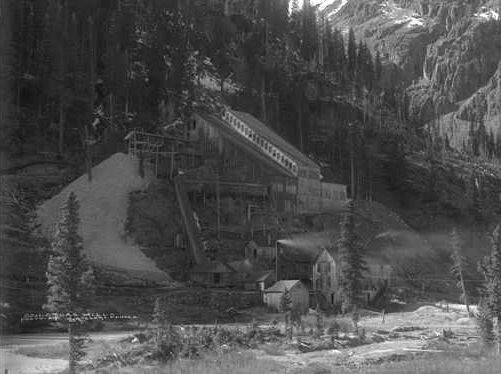 Mountain City was the first name given to the ragged string of camp-like settlements, but as the boom subsided and the hard work of extracting the gold began, the remaining population began to coalesce into more organized town sites. Up the gulch to the west was Nevada, also known as Nevadaville or Bald Mountain. Below it lay Central City, and further down, where the gulch flowed into the North Branch of Clear Creek, was established Black Hawk Pointe. Most accounts insist the name came from an early "stamp" mill brought in from Illinois and named for the famous Indian chief. 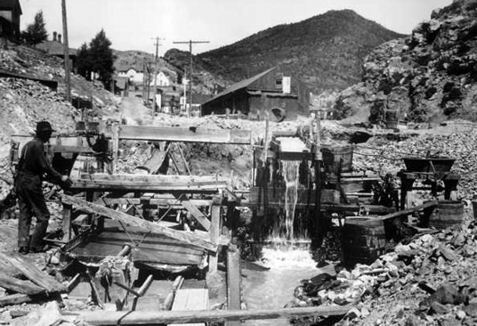 Driving water wheels and flowing through sluices with its abundant supply of water, something in short supply elsewhere in the gulch, Black Hawk quickly became the milling center for the gold ore mined throughout what became known as Gilpin County. 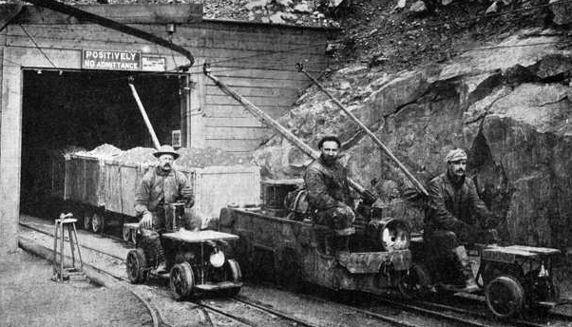 First by ore wagon, and later by train, tons of precious rock were sent to Black Hawk for various processes designed to extract the maximum amount of gold from the quartz ores. 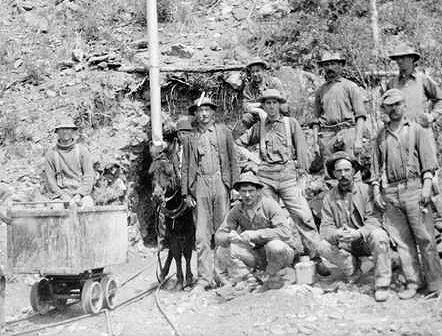 Gold mining in the Central City District decreased rapidly between 1900 to 1920, as the veins were exhausted. 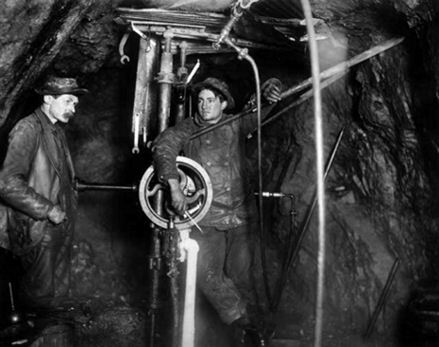 Mining revived in the early 1930s in response to the increase in the price of gold from $20 to $35 per ounce, but then virtually shut down during World War II when gold mining was declared non-essential to the war effort. The district was enlivened in the 1950s by efforts to locate uranium deposits, but these proved unsuccessful. 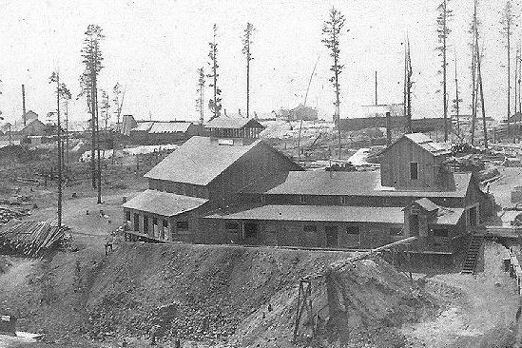 Victor was founded in 1891, shortly after Winfield Scott Stratton discovered gold nearby. 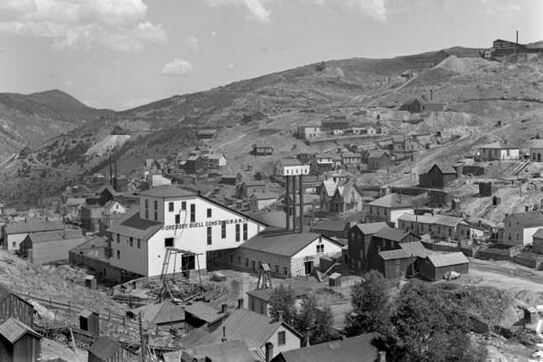 The area boomed as the surrounding Cripple Creek mining district quickly became the most productive gold mining district in the United States. 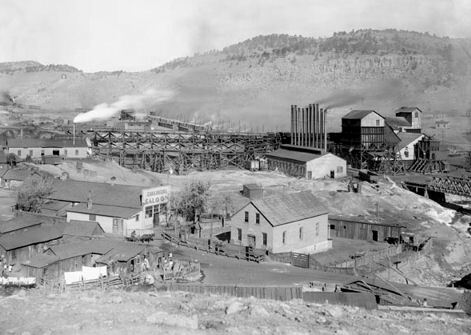 Although Victor's fame was overshadowed by that of its neighbor, Cripple Creek, many of the best gold mines of the Cripple Creek district were located at Victor, including W. S. Stratton's Independence and Portland Mines. 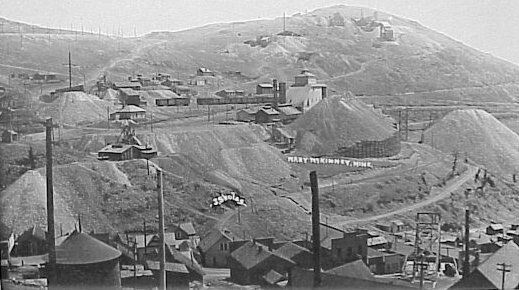 Two periods of labor unrest (1893-1894 and 1903-1904) led to the Cripple Creek Mining District becoming union-free after 1904. Government troops were called out in both instances but most violence took place in the 1903-1904 period. 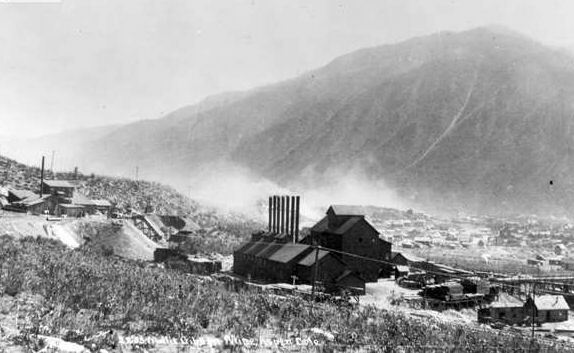 Albert Horsely, better known as Harry Orchard, came to the district from the Coeur d¹ Alene and set a bomb on the 600 level of the Vindicator Mine resulting in the death of the Superintendent and one of the foremen. 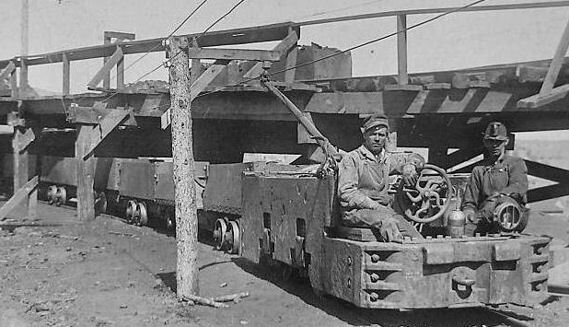 Shortly, thereafter, he blew up a railroad station in the town of Independence as the night shift crew from the nearby Findlay Mine were waiting to go home, killing 13 miners. Orchard fled from the district to Idaho where he then assasinated Ex-Governor Steunenberg with another bomb. 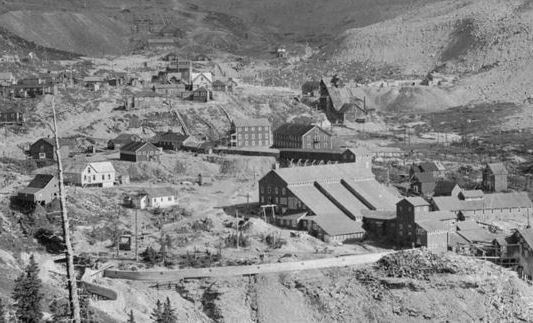 Through 2005, the Cripple Creek Mining District produced about 23.5 million troy ounces of gold. 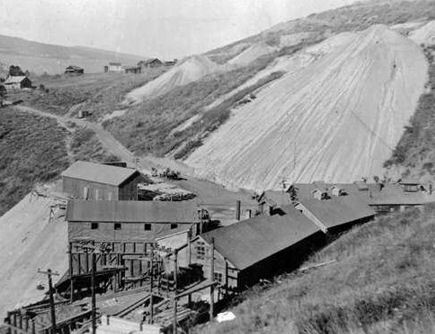 The old underground mines are now exhausted, but open pit mining has operated since 1994 east of Cripple Creek, near its sister city of Victor, Colorado. 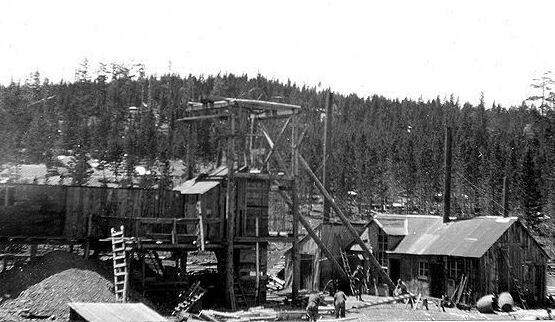 During the early twentieth century, a vast deposit of molybdenum was discovered in Climax, 14 miles northeast of Leadville. This metal is used in the production of modern high strength steel alloys. 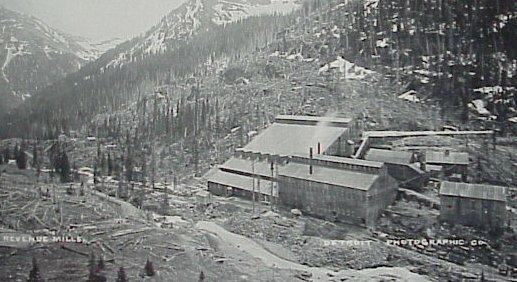 The Climax Molybdenum Company created what was to become one of the largest open pit mines in the world to extract the ore from Bartlett Mountain. 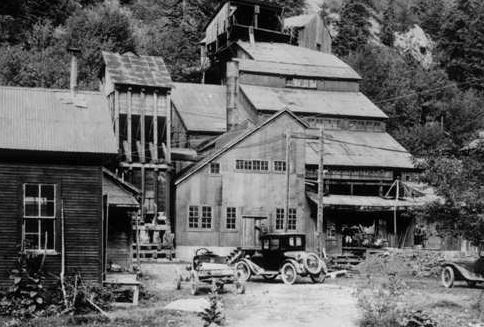 By the 1940's annual production at the mine was over $13,000,000. 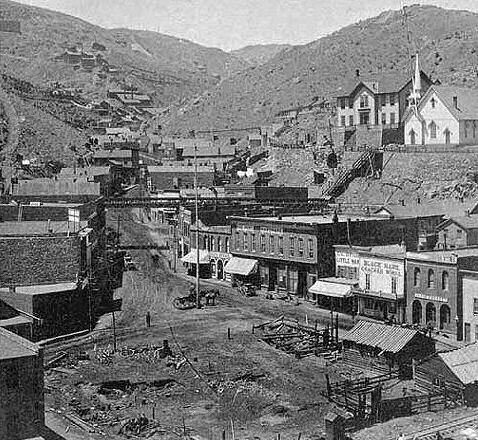 Georgetown was founded in 1859 during the Pike's Peak Gold Rush by George and David Griffith, two prospectors from Kentucky. It was named "Georgetown" in honor of the older of the two brothers. 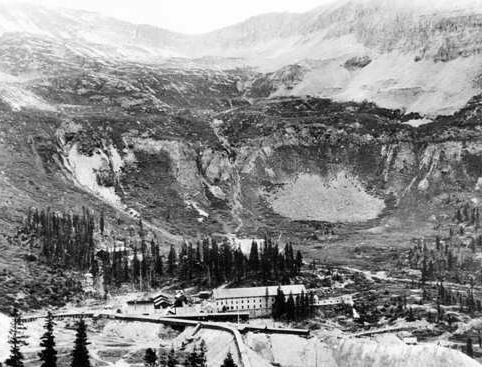 Although founded during the gold rush, the town grew rapidly following the discovery of silver on September 14, 1864 by James Huff at a site approximately 8 miles up the canyon in the Argentine Pass area. 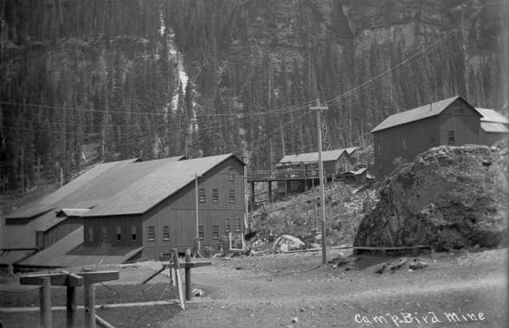 In the following years, hundreds of mines were dug in the mountains surrounding the town and the town quickly grew into a center for prospectors and mine workers in the surrounding mountains. 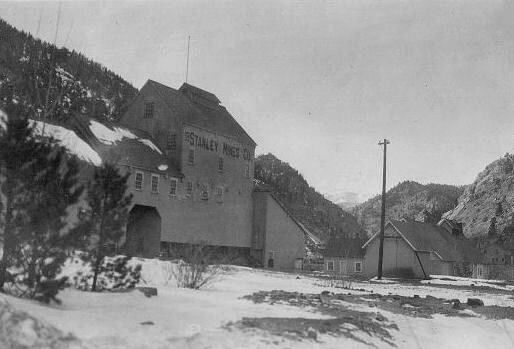 Located in the valley floor, the town itself was not a mining camp but a center of commerce and entertainment for miners in the surrounding mountains. 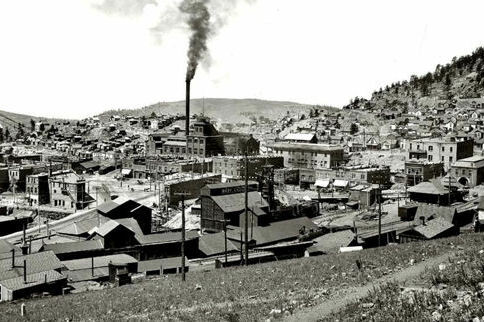 Georgetown was incorporated on January 10, 1868, a few months later it wrested the county seat from nearby Idaho Springs, which is a much larger community today. Georgetown is the only Colorado municipality that still operates under a charter from the Territory of Colorado. 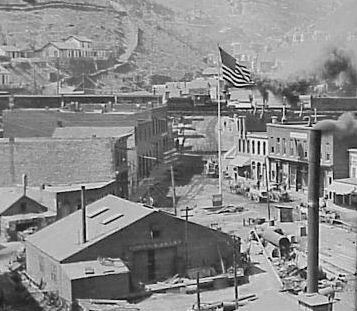 The building of the narrow gauge Colorado Central Railroad up the canyon from Golden in the 1870s further increased the central position of the town. 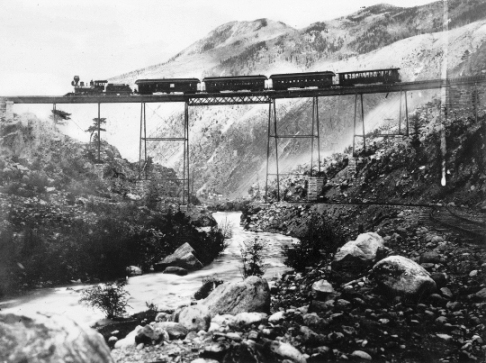 Although most of the railroad was later removed, a portion remained between the Georgetown and Silver Plume and is operated today as a tourist railroad called the Georgetown Loop. 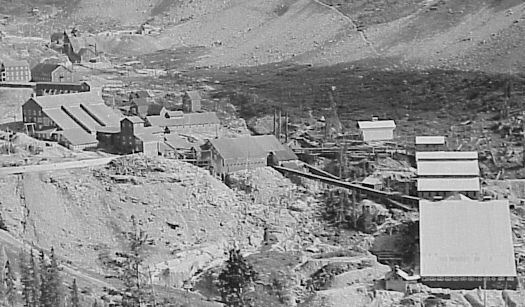 The town experienced its greatest growth and prosperity during the Colorado silver boom of the 1880s when it rivaled Leadville to the west as the mining capital of Colorado. 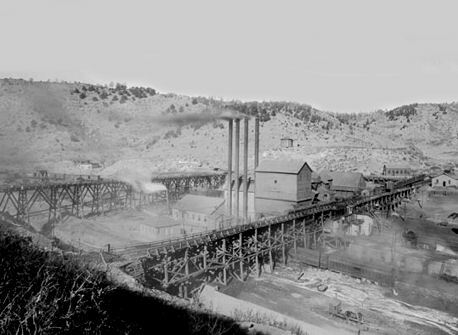 At one time, before the collapse of the silver boom in 1893, the town population exceeded 10,000 and a movement arose briefly among local citizens to move the state capital there from Denver. 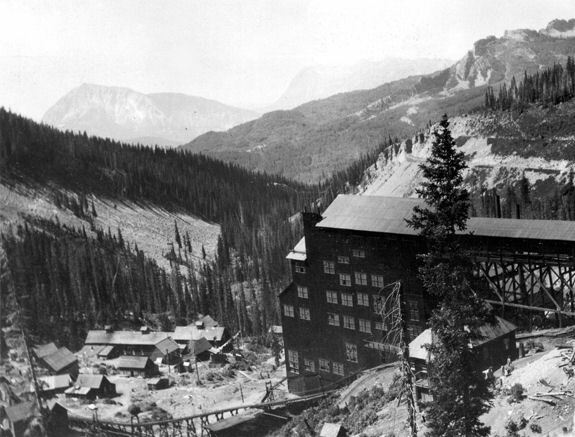 Silver Plume was named for the Silver Plume Mine, which was named for feathery streaks of silver found there. 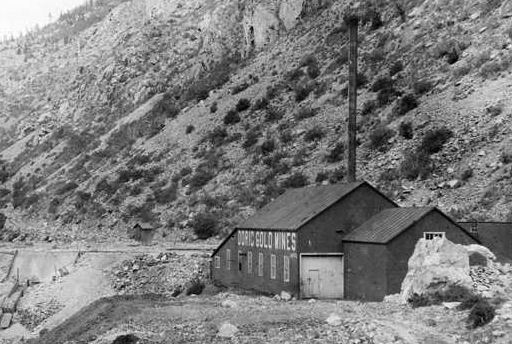 Although gold was the original metal sought in the Georgetown/Silver Plume area, by about 1864 it was recognized that the grayish rock everyone had been kicking around and cursing was in fact silver ore, and the boom era for Silver Plume began. 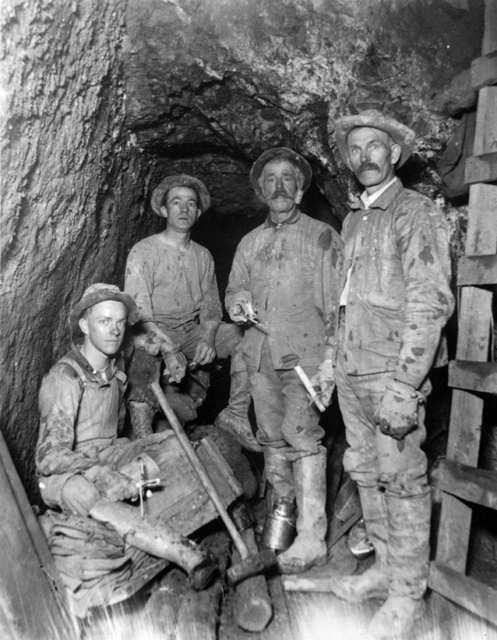 When silver mining declined after 1893, to be replaced briefly by lead mining to support the WWI war effort. 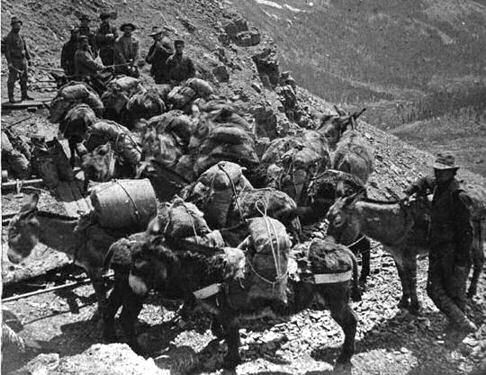 Aspen's roots are traced to the winter of 1879, when a group of miners ignored pleas by Frederick Pitkin, governor of Colorado, to return across the Continental Divide due to an uprising of the Ute Indians. 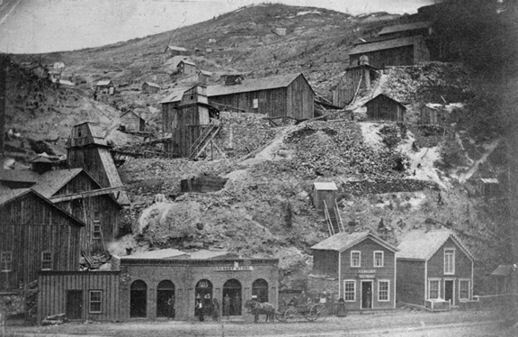 Originally named Ute City, the small community was renamed Aspen in 1880, and, in its peak production years of 1891 and 1892, surpassed Leadville as the United States' most productive silver-mining district. 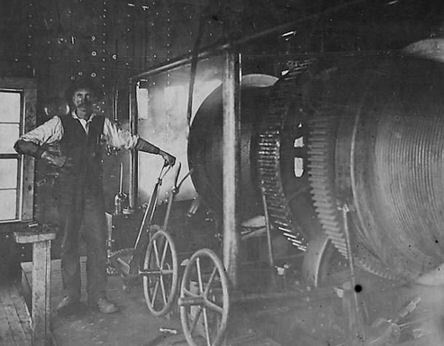 Production expanded due to the passage of the Sherman Silver Purchase Act of 1890, which doubled the government's purchase of silver. 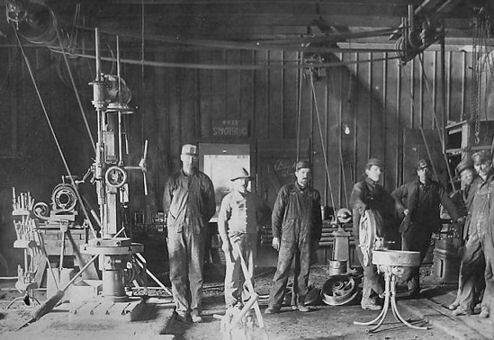 By 1893, Aspen had banks, a hospital, two theaters, an opera house and electric lights. Economic collapse came with the Panic of 1893, when President Cleveland called a special session of Congress and repealed the Shernman Silver Purchase Act. 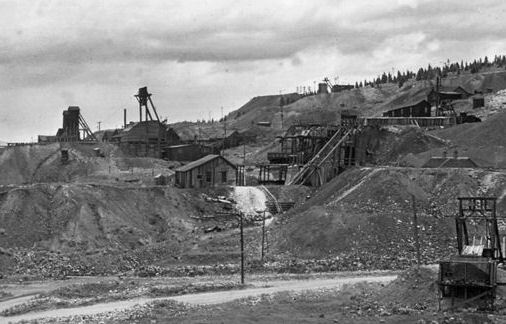 Within weeks, many of the Aspen mines were closed and thousands of miners were put out of work. 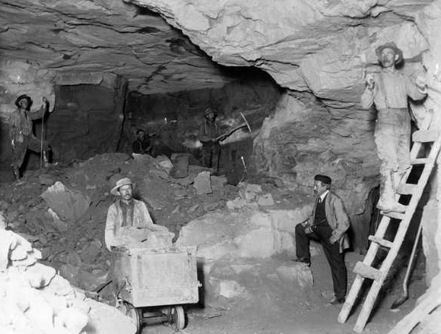 Eventually, after wage cuts, mining revived somewhat, but production declined and by the 1930 census only 705 residents remained. Although radium had been discovered in 1898, it had been derived from pitchblende, and the radium content of carnotite was not known. Carnotite was suspected to contain radium as early as 1903, on the basis of the anomalously high radioactivity of carnotite ores. But it was not until 1911 that the radium content of carnotite was confirmed by the Marie Curie laboratory in Paris. 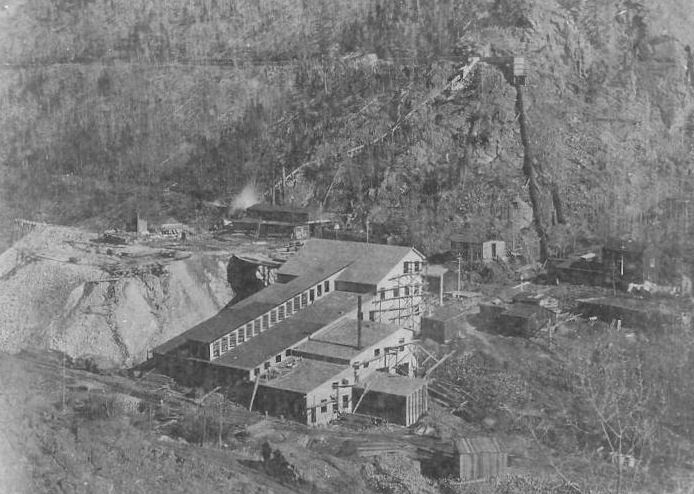 Although no more than a trace of radium was present in the ore, newly discovered medical applications had made radium worth $100 per milligram, making the radium in the carnotite ore worth much more than the vanadium or uranium. Once carnotite was known to contain radium, prospectors rushed to the Colorado Plateau of southwest Colorado and adjacent southeast Utah, and found carnotite-bearing sandstones of the Jurassic Morrison Formation in Mesa, Montrose, and San Miguel counties in Colorado. 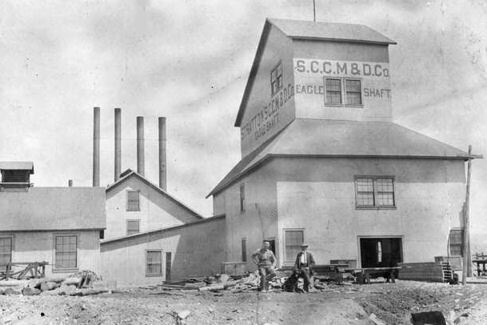 The carnotite was at first shipped to Europe for processing, but by 1913, the Standard Chemical Company had built a radium processing plant in Montrose County that had become the world’s largest supplier of radium. 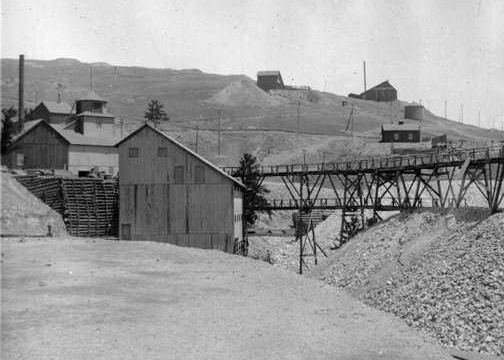 The Uravan mineral belt of Colorado and Utah supplied about half the world's radium from 1910 to 1922, and vanadium and uranium were byproducts. 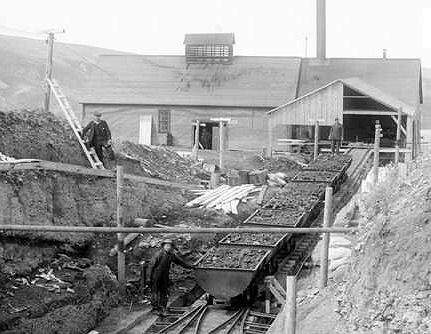 The mines were forced out of business in 1923, when rich pitchblende deposits in the Belgian Congo forced down the price of radium. 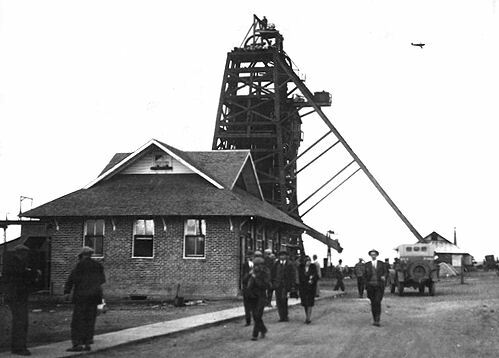 Mining revived in 1935 when the price of vanadium rose, and boomed after World War II when the government stockpiled uranium for nuclear weapons programs. 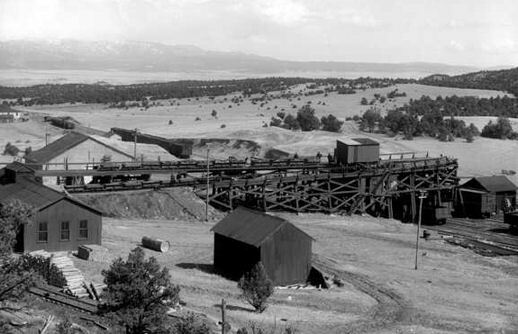 The Uravan mineral belt contains the only currently producing uranium mine in the state, the Sunday mine near Uravan, Colorado, owned by Denison Mines. 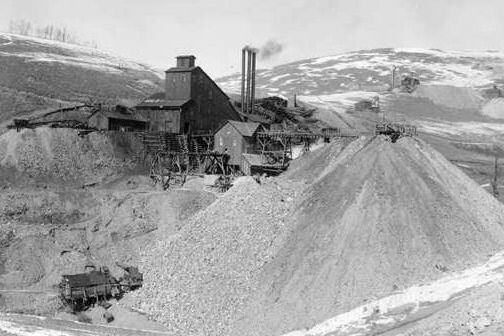 The Black Iron zinc mine at Red Cliff, Col., owned in part by the American Zinc Company of Helena, Montana, was purchased for $800,000 in fee and lease by the Empire Zinc Company of Colorado, a subsidiary of the New Jersey Zinc Company, in 1917. 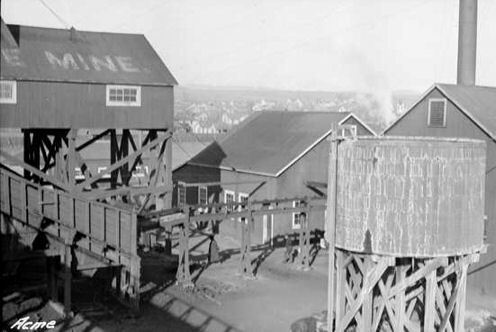 The New Jersey Zinc Company had first entered Gilman in 1912, and over a period of years bought all the principal mines and the entire townsite. 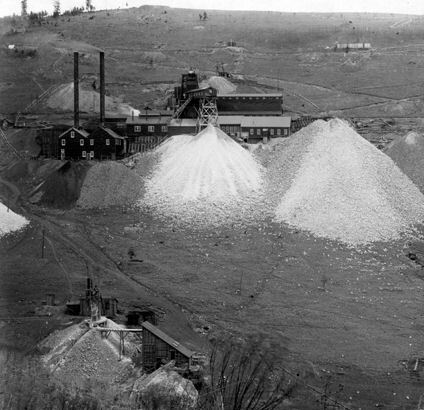 Zinc was the economic mainstay until 1931, when low zinc prices forced the company to switch to mining copper-silver ores. 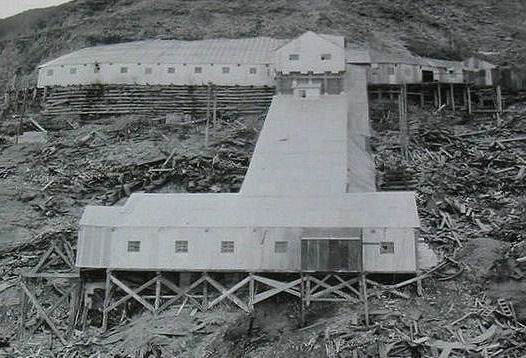 Zinc production resumed in 1941, remaining the principal product of the mines until they were closed in the 1980s.